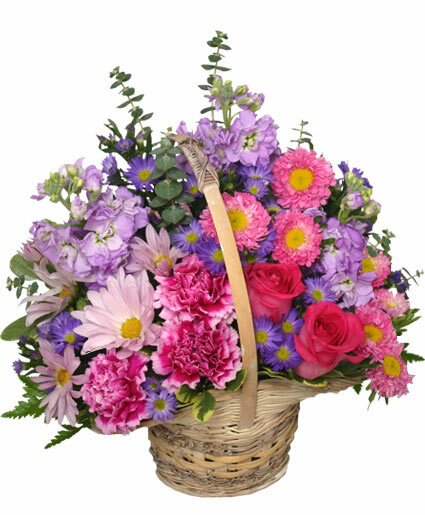 A surprise gift of flowers can provide a "pick me up" that lasts for days, so boost her spirits to the sky with this Sweetly Spring Basket from J. MAISEL'S MAINLAND FLORAL, your local Galveston, TX florist! Price 1 is for Single Rose Budvase (NO delivery) Price 2 is for Double Rose Budvase (NO delivery) Price 3 is for Triple Rose Budvase can be delivered only in zip codes 77550, 77551, 77553, Single and double rose budvases are not eligible for local delivery, they are for carry out only. **Please note that our MINIMUM delivery to any zip code other than 77550, 77551, and 77553 is $49.95*** Give us a call at 409 765-5683 or send us an e mail at 765Rose@gmail.com to ask for any other special color or container that you desire. 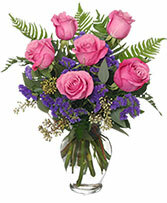 There are many color combinations that this elegant bouquet can be designed with depending upon the season. 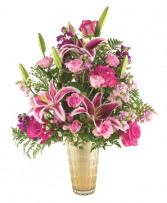 Please call us at 409-765-ROSE(7673) to determine current availability or just allow our designers to create something very special based upon the freshest and best combination of flowers. If you place you order without calling us it indicates that you prefer to allow our design team to create a memorable moment for your loved one.